Today’s image is another in our series of roundups of posts contributed by our guest curators. This time we are looking at the posts Nigel Macpherson Grant contributed, mainly about prehistoric ceramics. Many of our posts have been based on his extensive knowledge and the detail published in reports and so much material in the VM_365 is based on his work. A report from an archaeological specialist could appear to be a dry prospect for the average reader, but Nigel’s are always filled with nuggets of information about the potters art or the patterns in form, fabrics and techniques current at any time which make for interesting posts for the VM project. On the left hand side of the picture is Nigel himself, who appeared in Day 2 of the VM 365 project, sorting through boxes in our store for more pottery examples. On the right of the picture are several examples of the pottery pictures Nigel produced for us, always with an interesting story to tell about how they were made or how they might have been used. The first at the top was a previously unreported Bronze Age Urn which featured on Day 212 of the VM_365 project, the middle image that featured on Day 155, showed how ceramics were influenced by other materials, in this case the stitching on leather containers and the third image from Day 172, shows a finely decorated Neolithic bowl from Ramsgate. Archaeology depends on the dedication of people who make the detailed study of a single type of artefact their life’s work and the contribution of our friend Nigel to Thanet’s archaeology is immeasurable and continues to grow. Day 84 Medieval pottery from a refuse pit in Margate. Day 304 Tiny ceramic tazza, Roman temple near Margate? Day 316 Roman pot lids. One size fits all? For the image today, Day 359 of the VM_365 project, we have a view in the Our Thanet series, taken from the crest of the hill at Elmwood Avenue and facing east across a valley cutting the chalk downland to reach the sea at Joss bay on the left side, between the Oast House and the North Foreland lighthouse. The lighthouse stands at the northern end of the North Foreland promontory, an isolated chalk ridge which runs across the horizon in the picture and on which some of Thanet’s most significant prehistoric discoveries have been made. The North Foreland is one of the geographical features of the British Isles whose name (Kantion) was recorded in ancient literature by the 3rd century BC Greek explorer, sailor and navigator Pytheus of Massilia (modern Marseille). On the valley slope to the right of the lighthouse a very complex cropmark of linear ditches and other features is often visible from the viewpoints around the valley. Excavations over many years have revealed that the cropmarks are the visible indicator of the very extensive prehistoric settlement that occupies the chalk ridge. At the right hand end of the image, a large residential block marks the site of the former St. Stephens college, where one of the largest excavations took place in 1999 and 2003. Previous VM_365 posts have explored the Neolithic and Bronze Age funerary monuments that were positioned with care to overlook the valley. Close to the new residential block a small Bronze Age round barrow was excavated in 1999. In one terminal of a gap in the circuit, the excavators revealed an unusual burial which had been covered with a large piece of whalebone. Examples of some of the earliest coins to have been produced by the Iron Age rulers of Kent have been found on the North Foreland, some connecting the area to the dynastic struggles that were affecting the people of Britain and the continent. The extensive Iron Age settlement produced many interesting finds, including a pair of Iron Bridle bits. Another series of VM_365 posts explored the fascinating story that is told by the discovery of an Iron Age burial inserted into a large abandoned grain storage pit. Was this a casual burial or a more formal rite taking advantage of the prepared ground of the abandoned settlement? Three blue glass beads worn around the neck of the woman buried in the pit suggest the latter. Several smaller sites have been excavated when the opportunity arises through house building or redevelopment on the estate that now encompasses the crest of the ridge. These have shown that the ridge was widely settled over a long period of time. One of the most significant finds was a Beaker period burial, discovered only a few centimetres below the drive of a house that had been built in the early 20th century. Archaeological monitoring of the house building plots has also shown that the ridge was heavily terraced while developing the estate and perhaps many archaeological sites were destroyed without record in the past. The area is certainly one of the most important archaeological landscapes in the Isle of Thanet and much must remain to be learned about this area. Today’s image for Day 357 is another one in the Our Thanet thread for VM_365. The overview of Dumpton Gap is taken from near the entrance to Seacroft Road, which is on the extreme left of the image. The view faces north across the bay where the deep valley meets the sea at the high chalk cliffs on the right side of the image. Only as far back as the late 19th century this landscape was open downland, but at the beginning of the 20th century, the benevolent seaside landscape attracted several large convalescent homes, which were served by new roads that were laid out on the cliff top esplanade. A view similar to the one in today’s image was published in a 1907 sale catalogue for plots in the area, posted on Day 41 of the VM_365 project. In the process of creating the framework of the dense suburb that now covers the valley, many significant archaeological discoveries were made. The earliest of these were recorded by Howard Hurd, one of Thanet’s heritage pioneers, who as Borough Surveyor for Broadstairs and St. Peters laid out much of the road network which can be seen in the catalogue photograph. On the slopes of the far side of the valley, on the horizon just left of the centre of the image is Valletta House, now Bradstow School, where Howard Hurd excavated and published a Bronze Age round Barrow and Anglo-Saxon cemetery. The site went on to be explored in several excavations as the gardens surrounding the house were developed over the next century revealing more Neolithic, Bronze Age and Iron Age features, as well as a further burial from the Anglo-Saxon cemetery. On the far left side of the image, an extensive Iron Age settlement located on the southern side of the valley which later became the site of a Roman building, was discovered by Howard Hurd in the early 20th century. A bone weaving comb from the site was published on Day 110 of the VM_365 project. The site was explored further in several excavations from the 1960’s to the 21st century when the development of suburban roads and closes with characteristic bungalows and semi-detached houses, were explored by Joe Coy, another important heritage pioneer. Pottery of Iron Age and Roman date from these excavations featured in several previous VM_365 posts. The landscape shown in today’s post is perhaps one of the richest sources of archaeological information in Kent, but is little known in the wider archaeological community because of the limited circulation of the publications of the excavations and the lack of any recent attempt to bring all the sites together and reconsider their significance. Perhaps this overview for the VM_365 project will serve as a start in that process. 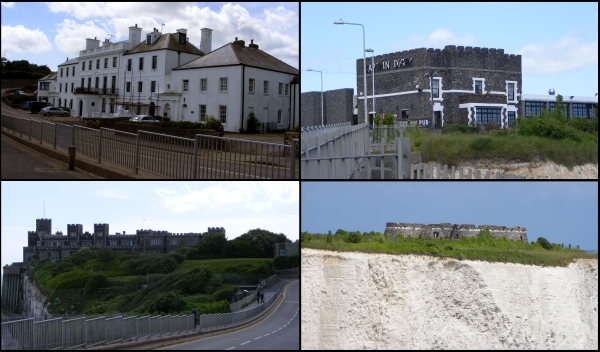 The image for Day 341 is another in the series of Our Thanet posts, showing locations that play an important part in the exploration and appreciation of Thanet’s heritage. The image shows a view taken facing south and south west from a downland hill top at Lord of the Manor, Ramsgate when part of the ring ditch associated with a Bronze Age round barrow was partly exposed in a training excavation in 2013. Although it is partly obscured by trees and buildings that have grown up since a railway cutting was pushed through the chalk hillside in 1847, it is still possible to see the vista across the low lying bay that could be seen from the vantage point of the raised central platform enclosed by the ring ditch. From the centre of the mound the horizon falls away in a wide sweep from the north east to the south, giving a view across Pegwell Bay. It can be no coincidence that a location commanding such an impressive view was chosen for the location of such a major monument in the Bronze Age. Everywhere on Thanet where such unique points which command similar impressive views over the landscape can be found, there are also concentrations of prehistoric monuments, some unusually large in size or very complex such as the Lord of the Manor 1 multi phase monument which featured all the way back on Day 21 of the VM_365 project. Artistic reconstructions of the development of the landscape over time featured in an earlier series of VM_365 posts starting on Day 265. This unique landscape is increasingly under pressure from development and it may soon not be possible to see what the prehistoric inhabitants of the Isle could see from the vantage points of the downland hilltops. Today’s image, for Day 337 of the VM_365 project and another in the Our Thanet series, shows four views of some of the ‘follies’ at Kingsgate Bay, Broadstairs that were constructed by Henry Fox, Lord Holland, in the 18th century. Henry Fox served as a Whig politician between 1735-1765 and was the father of the Honourable Charles James Fox, another famous Whig Politician. As Lord Holland he held various posts including Paymaster-General of the Forces, a post that he used to increase his personal fortune from the public purse and from which he was finally forced to resign in 1765. Lord Holland came to Kingsgate in 1761 to escape his political life and public hatred. Kingsgate Bay had formerly been called called Bartholomew’s gate but gained its present name from the landing of Charles II at the bay in 1683. A medieval arch and portcullis once defended the ancient gap through the cliffs, but it was destroyed by gales in 1819. Lord Holland built a house and surrounded it with follies, structures built in the style of ruins from antiquity, which were then fashionable. Holland House (shown in the top left of the picture) was constructed in classical style around 1760. The house fell into ruins around the end of the 18th century and most of the present façade dates to the mid 19th century when it was rebuilt. The original central portico of the Holland House was removed to the Sea Bathing Hospital at Margate. The follies at Kingsgate included a Bede-House, a Castle, a Convent and a temple, although most of the Follies concealed practical purposes. The Bede-House (in the top right of the picture) was constructed on the cliff on the western side of Kingsgate Bay in the late 18th century as a house of entertainment for visitors who flocked to see all of Lord Holland’s follies. By the early 19th century the building had become known as the Noble Captain Digby, after a nephew of Lord Holland who commanded HMS African at Trafalgar. Much of the original structure was destroyed when it fell into the sea during a strong gale, but surviving parts of the earlier structure are incorporated into the mainly early 19th century construction of the present Captain Digby Inn. The temple of Neptune on White Ness (in the bottom right of the picture) was built in the late 18th century as a miniature copy of the Tudor blockhouses at Camber and Deal which Henry VIII used to defend the south east coast. In the Second World War the temple tower served as a post for the Royal Observer Corps. In the same year that the Temple of Neptune was built, a respected local Vicar recorded his opinion that a tower named the Arx Ruohim, or tower of Thanet, had been built on the same site by King Vortigern in A.D. 448. The story was taken as fact and even gained places on reputable maps and in local guidebooks and as a result people came to to look at the ‘Saxon’ Tower. Kingsgate Castle (bottom left of the image) was a copy of a Welsh Castle and was constructed on the cliff top on the eastern side of Kingsgate Bay. This building was used as stables by Lord Holland but eventually fell into disrepair. A large round tower is all that remains of the original building. The structure was added to over the years and later rebuilt in 1913 by Lord Avebury, incorporating most of the original fabric. The building has been converted into residential flats in recent years . Another of the follies was known as the Convent (not pictured). Originally built as five cells arranged around a central cloister it was intended to be used as a convent for Anglican Nuns, but they never occupied the building. Instead the Convent was used as accommodation for the poor and industrious members of Lord Holland’s estate and also used as overflow accommodation for guests at Holland House. By 1831 the convent was rebuilt and renamed Port Regis. The remains of the medieval entrance to Bartholemew’s gate were rebuilt in the grounds. Another commonly held ‘historical fact’, probably originating in similar circumstances to the Arx Ruohim myth, is still preserved in a local place name ‘Hackemdown’, which is even recorded on Ordnance Survey maps. The name derives from an ‘historical event’, which was actually invented by Lord Holland. A barrow mound in the grounds of the convent was opened by Lord Holland and enough human remains were found for Lord Holland to suggest they were buried after a battle between Saxons and Danes. Lord Holland commemorated his invention by building a tower on the site of the barrow mound, complete with an inscription to the dead. The tower became known as Hackemdown Tower and other barrow mounds nearby became known as Hackemdown Banks. The cliff which Holland suggested the remainder of the dead from the battle were pushed became known as Hackemdown Point. While Lord Holland’s battle was pure fiction, it was based on real archaeological finds. Holland was prompted to open his barrow mound after a farmer at Reading Street Farm had opened a larger mound nearby in 1743, in the presence of many hundreds of people. Records suggest that deep in the solid chalk under the mound several stone capped graves were found. Human skeletons bent almost double and several urns of coarse earthenware filled with ashes and charcoal were reported to have been found. Both the mounds opened by the Reading Street farmer and Lord Holland are more likely to date to the late Neolithic or Early Bronze Age. Today’s image for Day 334 of the VM_365 project shows a view of Minnis Bay, taken from the east, facing west toward Reculver. This view begins another short VM_365 series showing you our Thanet; the historic isle that we as archaeologists see around us. Before the Bronze Age this landscape would have been significantly different. Sea levels were significantly lower than they are in the present day and much of the coastal area visible here would have been dry land. A freshwater creek extended along the approximate route of Minnis Road, just out of the picture to the right. The flat greyish green area of the beach visible in the foreground are the remnant of chalk cliffs that once formed the edge of the valley the creek flowed through, which has been eroded to a flat platform by the sea pushing into the creek mouth in the later prehistoric period. Many prehistoric finds including Palaeolithic and Neolithic worked flint have been found off this foreshore, the tools used by the people who once lived on the land that has been lost to the sea. The remains of a Bronze Age settlement was discovered on the wave cut platform around the mouth of the creek in 1938. A Bronze Age hoard discovered in one of the pits has previously featured on Day 202 of the VM_365 project. Beyond the wooden groynes that can be seen in the middle ground of the image is the former northern mouth of the Wantsum Channel, which became more significant as the sea advanced from the Bronze Age onward and separated what would become known as the Isle of Thanet from the mainland of Kent. The sea continued to eat away at the land that was occupied by communities in later periods. The bases of Late Iron Age and Roman pits and other features, possibly wells, have also been identified as truncated pits on the wavecut platform on the foreshore. Artefacts retrieved from these pits included a Roman millstone, a two handled wine jar, and a colour coated dish. Eroding pits and archaeological features of Late Iron Age and Roman date have been identified in the eroding cliff edges at Minnis Bay. On the horizon on the far right of the image is the site of a Roman fortress built on land at Reculver, overlooking the mouth of the Wantsum Channel and the west coast of the Isle of Thanet. The Fort and the settlement associated with it is beginning to be claimed by the sea. Coastal erosion has exposed the bases of Roman wells which are sometimes visible at low tide on the wave cut shelf at Reculver. Reculver was also the site of one of the earliest and most important Anglo Saxon monasteries. The former monastery and the church that now stands at Reculver were built on the site of the Roman Fort and elements of all these structures have been revealed in a long series of archaeological excavations. The vantage point of the cliff top at Minnis Bay provides a view of thousands years of Thanet’s history which the archaeologist’s eye can distinguish from the natural landscape. 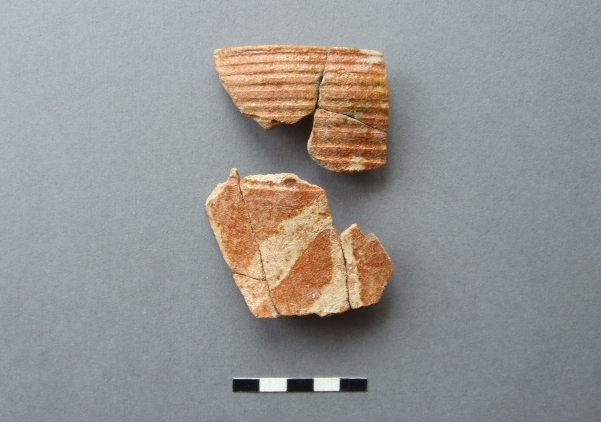 The image for Day 318 of the VM365 project shows sherd fragments from a medieval tableware jug found in 1979 in an excavation at Netherhale Farm, Birchington. The late David Perkins conducted a trial excavation to test the cropmarks of a double ditched enclosure on land between Birchington and St.Nicholas-at-Wade. The excavation revealed a Mid-Late Bronze Age farmstead enclosure (c.1350-1150 BC) underlying a medieval farmstead enclosed with a ditch. This site could possibly be the medieval forerunner of the modern Netherhale Farm which stands just to the north of the site. The cropmarks lie on a very slight knoll and presumably was chosen in both periods of settlement for its well-drained position. Apart from some deeply cut ditches and pits, the ditches and the settlement they enclose have been heavily plough-reduced. The Medieval phase of occupation produced the fragments from the tableware jug shown above which are from a fairly tall ovoid-bodied jug. The rim is shown in the upper part of the image, with a horizontally incised neck below and the upper shoulder and body has been painted in white slip with vertical and diagonal stripes under a clear orange (iron) glaze over. The jug was made at the Tyler Hill potteries near Canterbury and the form, type of decoration and the firing qualities date its manufacture to between c.1250-1325 AD, a period known in art-historical terms as the ‘High Medieval’ . Although this vessel is perhaps not as constructively creative as the Scarborough Ware ‘knight’ Jug or the south-west French polychrome-painted jug which were contemporary with this example, its striking colours and design would have made a handsome addition to the farmstead’s dinner table. Today’s image, for Day 307 of the VM_365 project, shows a large sherd from a Middle Bronze Age, Deverel Rimbury style, pottery vessel that was excavated from the enclosure ditch that featured in the post for Day 306. 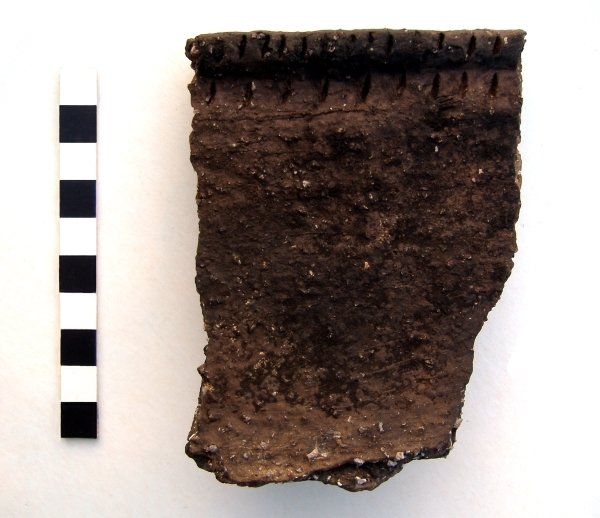 The sherd is one of eleven fresh conjoining sherds, including five small fragments, made of a characteristic heavily flint gritted fabric. The sherds come from the rim of a large Barrel Urn, measuring approximately 28cm in diameter at the rim and widening below the shoulder. The rim is decorated externally with two parallel rows of fingernail impressions. The survival of such a recognisable and substantial collection of dateable pottery in a tiny remnant of an ancient settlement, demonstrates the value of observing the deposits that are revealed when construction sites clear a keyhole view into the ancient landscape. Today’s image for Day 306 of the VM_365 project shows another image from our series looking at archaeological sites revealed through the keyhole of small discoveries at sites in built up areas under Thanet’s towns, where construction work has opened a window into an ancient landscape that has been lost for many years. The discovery was made in an area where a substantial amount of urban development has taken place, which has masked and sometimes destroyed the deposits and features that could provide evidence of the past occupation in the area. 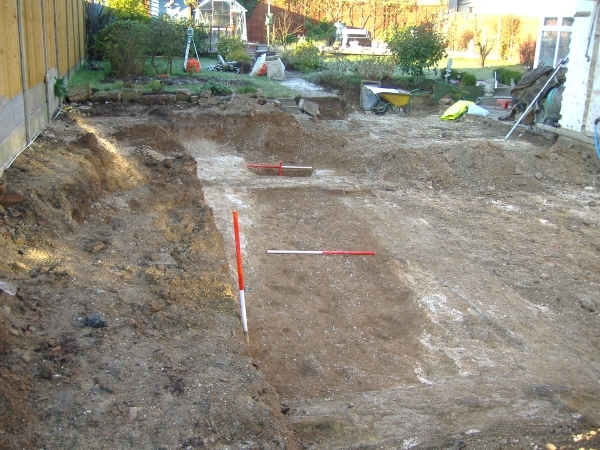 The image shows a short stretch of an enclosure ditch dated to the Middle Bronze Age, which was exposed in groundworks for the construction of a house. The site had already been occupied by an extension that was used as a temporary police cell for a former police house and a garage. The foundations for the police cell can clearly been seen in the image above, located on the right hand side of the ditch before turning to cut it. The ditch contained twelve sherds of pottery from three seperate Deverel Rimbury style Middle Bronze Age vessels. The discovery of a small surviving stretch of a Middle Bronze Age enclosure is a significant contribution to the prehistoric archaeology of the Isle of Thanet. The enclosure ditch may have formed part of a wider settlement and such features are always an important part of any attempt to map the historic occupation of the landscape. Today’s image shows two views of a very small excavation carried out during the construction of a garage at North Foreland Road, Broadstairs in 2004. The North Foreland landscape is particularly rich in archaeological remains. Cropmarks identified by aerial photography show an ancient trackway along the edge of the hillside. A large open area excavation carried out in recent years on the previously undeveloped playing fields of the former St Stephen’s College confirmed that the area had been occupied at least since the Early Bronze with the construction of burial mounds and during the Iron Age when a settlement was established which included a Middle Iron Age enclosure and significant numbers of postholes and large storage pits. The area to the east of the site was developed for housing from the late 19th century onwards and although occasional archaeological discoveries were reported these were generally made before a time when the significance of the area was understood and archaeological features were often not recorded in detail or at all. So how do we fill in the blanks in an area that has already been developed? As a local archaeological organisation, we are often involved in very small scale construction projects such as, for example, a small garage for a house along North Foreland Road, not far from the St Stephen’s site shown in the images above. The excavations only covered an area of approximatley 6 metres by 5 metres and the ground had already been disturbed by modern drainage which is visible as a linear stripe of dark soil visible above the T shaped scale in the picture on the right. However, eight pits and postholes containing Iron Age pottery still survived suggesting that the Iron Age settlement excavated at the St Stephen College site was much more extensive. An example of one of the pits is shown in the picture on the right. Through the keyhole of small investigations such as these we can fill in the missing detail and gradually build up a bigger picture of the landscape. VM_365 Day 365 More, much more than this! editor on How do you make Roman Armour from household items? Laurie on How do you make Roman Armour from household items? Ariel M on How do you make Roman Armour from household items? ness on How do you make Roman Armour from household items?